This corner warehouse on Bond Street is very large development site in a very hot area - Gowanus. 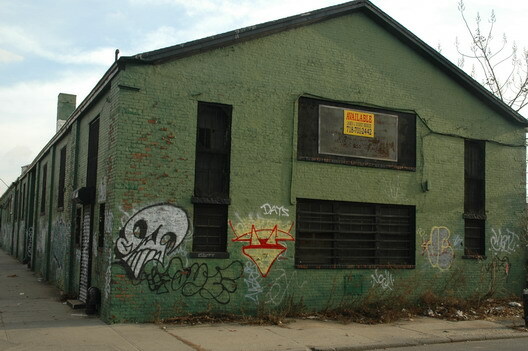 The warehouse is located on the Gowanus Canal, hugging a bridge connecting the two neighborhoods. Lots of very famous artists have bought large studios there. The zoning has been changed on a number of properties to allow for more building. Currently there are several condo conversion projects underway. The building itself is 40' by 247' and the lot is 28,500 square feet. The current zoning for the property is commercial, but the listing doesn't mention the ongoing process of an overall rezoning for Gowanus. The BSA denied a variance for this property several years ago and the proposed development was the impetus for forming FROGG. I believe the owners are the same developers as 340 Bond St. The prior owner was Regency Carts which was also the owner of 333 Carroll St. This has always been my fave bldg in the Gowanus.